**Gift card received for consideration, all thoughts are 100% my own. If I were to be completely honest, I'm not a dog person. At all. In fact, I'm actually very much afraid of dogs. So, what on earth would I be writing a post about a movie with a title like 'A Dog's Purpose'? It doesn't make much sense, does it? I wouldn't have thought so either until very recently when we opened our hearts and our homes not to a dog, but to a cat. For a long time, I saw having a pet of any time as just another mouth to feed and someone else to clean up after. Well, I can't lie--- she certainly has been that too---especially the latter. Still, that is not all she has become to our family. She has a purpose! Her purpose is my son. For years we have tried method after method to try and help my son with his hyperactivity and aggression. We have tried weighted vests, compression vests, big squeezes, spinning toys...the list goes on. But it was this sweet cat that finally did the trick. She seemed to know just what he needed and gave it to him. It was an immediate and evident love. It was being introduced to this new love, by pure coincidence or so it seems that I truly began to understand the purpose to pets. 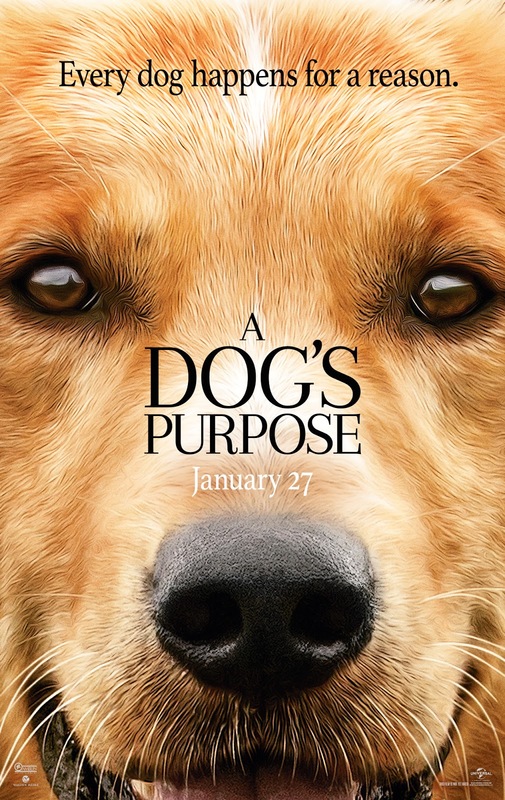 Based on the beloved bestselling novel by W. Bruce Cameron, A DOG’S PURPOSE, is a sweet and lovable family film that shares the soulful and surprising story of one devoted dog (voiced by Josh Gad) who finds the meaning of his own existence through the lives of the humans he teaches to laugh and love. Told from the perspective of “everybody’s best friend” the film highlights the importance of familial bonds, and the unconditional love we have for our best friends. The movie stars Dennis Quaid, Britt Robertson, K.J. Apa, and John Ortiz. Sounds like a great story, right? But it's also helping to promote a wonderful cause too. They've partnered with non-profit Best Friends Animal Society to raise awareness of animal adoption--- because every dog deserves the chance to live their purpose! You can find out more about this movie here. A Dog's Purpose will be in theaters this Friday, January 27th! I would like to see this movie, even though there are nut jobs already wanting to boy-cott it because they have nothing else better to do with their time. I would love to see this movie. Thanks for the giveaway! Aw, what a great movie this sounds like!! I can't wait to see it!! I love dogs myself!! This movie is going to be a tearjerker I can tell. Can't wait to take my grandaughter to see this. This movie is gonna totally make me weep like a baby. This looks like a really cute movie. I appreciate that it is something that the whole family could watch together. This looks like a sweet family movie. This looks like one of those movies that is going to touch my soul and make me cry. This movie is getting a lot of attention due to supposed dog cruelty but I have to say the video I saw doesn't look like abuse at all. With that being said, this looks like a great family film. Great movie from the trailer! Can't wait to see it. LOve movies day with my kids. I would like to take kids to see this movie. I am looking forward to seeing this movie. Our family is of the notion that dog really is man's best friend. I'm with you - not really a dog person, but looks like this will be a nice film. Looking forward to seeing this movie with my daughters! This looks like a good movie and I'd like to watch it with my teen sons. I'm sure I'll need to bring a few Kleenex. Looks like a sappy family film. Thanks. This movie looks like a wonderful movie for the whole family to see. I love movies that have dogs or cats in the story. This looks a great movie for the whole family.